Merging the two together is extra fun. The day you get married is a day full of love and adventure and happiness. All the emotions of marrying the love of your life are running high, and you’re looking forward to spending the rest of your life together. It’s a day when you have an extra sparkle. You feel extra beautiful. You notice the tiniest details and the grandest moments, and you find yourself wishing that day would last forever. And years later, when you look through your wedding album, seeing all the photographs of your destination wedding in Alaska will trigger all the memories, the joy, the awe, and the nostalgia. There’s no way to lose when you choose a destination wedding in the middle of the beautiful Alaskan scenery. In the hands of the right photographer, your experience will not only be unforgettable, your memories will be preserved for you and for all those who weren’t there to share the moment with you. 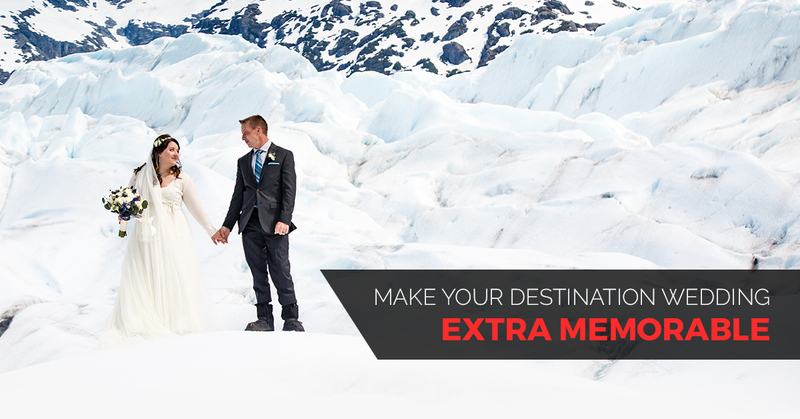 Here are our tips for how you can get the most out of your Alaskan destination wedding. If you want a destination wedding with breathtakingly beautiful photography, the easiest way to do that is to choose a location that comes with the backgrounds, landscapes, and scenery already in place. Here are some of the features that will make the backdrops in your Alaskan wedding photography absolutely stunning. There’s nothing that commands our awe and amazement quite like some majestic mountains piercing the sky. While your friends might be getting married in front of a stained glass window of a church and taking their photos in front of a trendy graffiti-filled brick wall, you’ll be getting married in front of the most dazzling view that will make all your friends’ jaws drop. There are mountains in other destinations, but with the mountains in Alaska, you’ll be almost sure to have the iconic snow-capped peak, which will coordinate perfectly with the train of your dress. Humans seem wired to appreciate water, and what can be better than the beautiful blue water of mountain lake that’s reflecting the deep blue sky? Pair a mountain and a lake together, and right there you’ve got an amazing view. The only thing that will take your breath away more will be the beautiful face of your bride. While many destinations offer mountains and lakes, not all of them offer the profuse variety of wildflowers that we get in Alaska. Go to any other destination, and you’ll mostly see trees, rocks, and grass covering the mountainsides. Not here! We have fields and fields of the most vibrantly-colored flowers that will add tiny details of life everywhere you look. It’s one thing to see the mountain scenery at a distance with lots of busy clutter or structures in the near vicinity. It’s quite another thing to step out on a beautiful point that overlooks a stunning view with nothing to be seen for miles but the scenery. White dress. White snow. What’s not to love? A glacier wedding is one of the things that becomes possible when you take a helicopter to your destination. Step out on the glacier and get married there (or, if you’ve already had the ceremony, step out with your wedding photographer and snap your photos there. It’ll be a set of unrivaled photos that you’ll never get tired of looking at. Want an extra pop of color? Try wearing bright red shoes. The ice princess meets her ice cave, and the photos show her exploring the palace with her prince charming. Alaska is full of magnificent ice that’s sculpted into caves, crevasses, icicles, pillars, and other charming designs that will show you off as the royal heir to the frosty kingdom. Alaska is full of beautiful places, but most of them are hard to get to and might require you to “rough it’ a little more than most people are prepared to do at their wedding. In other words, you’ll also want a place that is close enough to civilization to offer you the amenities that you need. 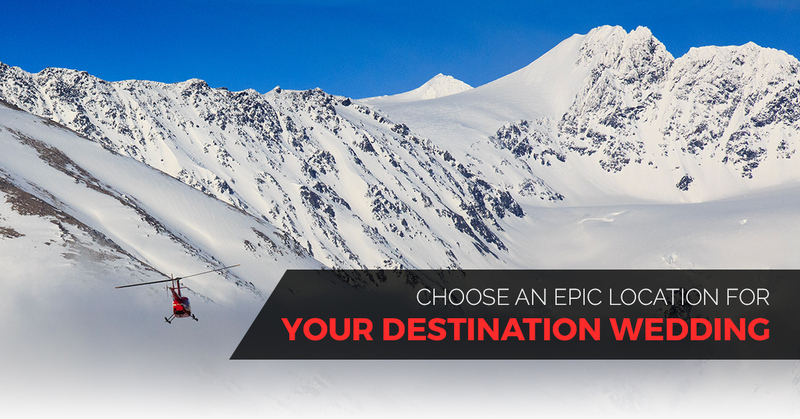 One such place is the Alyeska resort, where you’ll get to stay in a comfortable room, book adventure wedding photographer Ralph Kristopher for your helicopter tour, and have a fabulous honeymoon afterward. Alyeska is not only in a beautiful location, it’s actually in what’s considered a rainforest. Yes! This part of Alaska is considered the northernmost coastal temperate rainforest in North America. Talk about having your cake and eating it, too—you’ve got the lush greenery of a rainforest paired with high, snowy mountain peaks and glacier-fed lakes. How can you improve on that? Don’t wait to schedule your Alaskan wedding, especially when you want to get in on the helicopter tour with destination wedding photographer Ralph Kristopher. Our sessions fill up fast, so make sure that you get the dates you want by booking now. View our helicopter wedding packages and contact us today to book your session. The photographer you choose for your Alaska destination wedding will make a big difference in the quality of the finished photos that you receive. The photos are a memory of one of the most special days in your life. They’re little moments, frozen in time, that encapsulate the emotions, the fun you were having, the things you did, the people who were there, and the memories that you made. 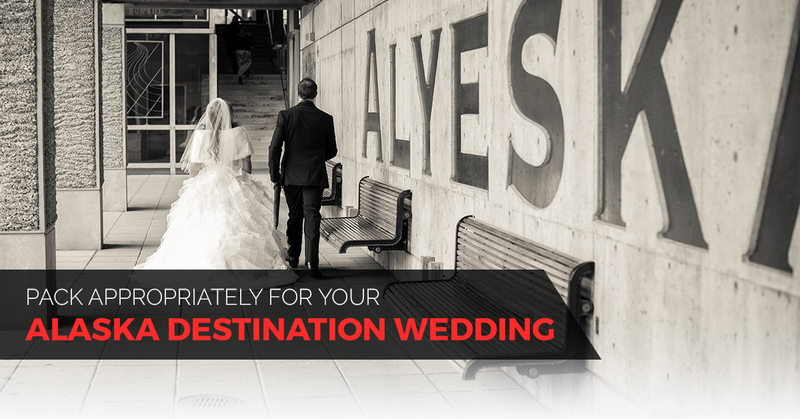 Plus, your photos will give you bragging rights for ages with all your friends who wished that they thought of going on a destination wedding like yours. 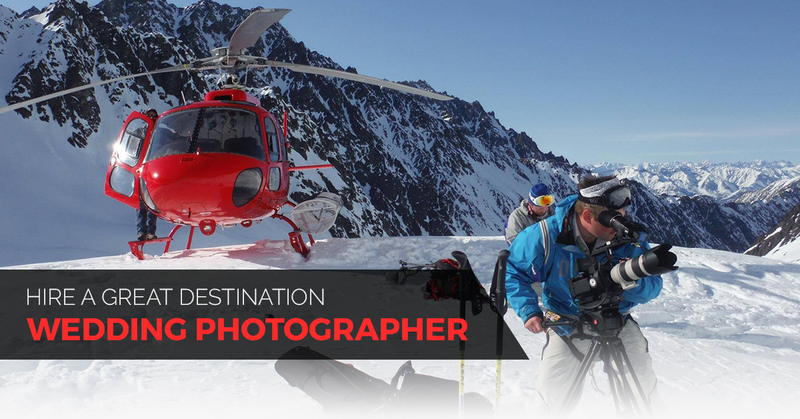 Here are some pro tips for finding a great photographer for your Alaskan photo shoot. Every photographer has a different style, and some people’s work will simply resonate with you more. When you look at the photos on a photographer’s site, do they call to you? Do they draw you in? Do they make you feel like you can imagine yourself right there in the shot? Then you’ve found a photographer who’s a good style match for your taste. A wedding is already hard enough to plan. Your photographer should make things simpler for you, not more complicated. It’s a mistake that some newer photographers make when they do weddings—they’re stressed out, so they end up making the couple more stressed out. A great photographer will be almost invisible while you do your thing, but when they’re needed, they’ll provide simple, easy-to-follow directions that will enable them to get great shots. How can you tell ahead of time if things will be simple? One tip is to look at the website. Are there simple packages that are already set up for you to choose? Is the booking process simple? When you communicate with the photographer, do you feel reassured, or does it seem like they’re flying by the seat of their pants? The more times a photographer has worked with clients, the more experienced they will be at making this part easy on you. There’s nothing worse than trying to contact someone and then never hearing back from them. Communication is an important piece of the puzzle, and a professional photographer will communicate with you in a professional manner by returning your voicemails, answering your questions, and getting back to you about things that you need to know. When you communicate with a potential photographer, ask yourself if you feel like you can work with this person. For pro photography in Alaska, check out Ralph Kristopher. If you’re holding a destination wedding at Alyeska, there’s only one photographer to consider. Ralph Kristopher is a photographer for the pros, such as Red Bull pro skier, Bobby Brown, and you can book him for wedding photography (helicopter or not) that you will fall in love with as soon as you see it. Contact us to reserve your dates! When you choose a destination wedding, nothing about your trip is ordinary. After all, you don’t get married every day, so that right there sets this trip apart. A destination wedding is a way to indulge yourself with all the things you’ve always wanted while breaking away from the tired old traditions that everyone has done at other weddings a million times. You want your wedding to be different. You want it to say something about you. You want it to be full of fun, rapturous moments that will still make you sigh with longing years later. You want moments of laughter, moments of doing “real things in real life” (not parading through a series of rituals that you’re not exactly sure what the point of them is). The best way to build a beautiful memory is to fill your day with unforgettable activities while also not overloading yourself with too much (save some activities for the honeymoon). Here’s a sample wedding day that we’d suggest to you. Wake up at Alyeska Resort and meet your beloved and any other family and guests at the Pond Café, where you’ll eat a delicious sit-down breakfast that will get you ready for the rest of the activities of the day. Start getting ready and let your wedding photographer, Ralph Kristopher, pop in separately on the bride and groom as the bridal party gets ready. The dress. The rings. The shoes. The emotional hug with your mom before the big event. You think you’ll remember all these little details, but you’ll love remembering them even more clearly through all the little details that your photographer captures. Experience your wedding ceremony with the select group of the people who are closest to you, whom you’ve invited to be there for your special event. Hold the wedding ceremony early, because there’s more to do before dark. However, you’re in Alaska in the summer, where we have about 19.5 hours of daylight, and even at midnight, the twilight is bright enough to function without assistance between June 8 and July 5. You want your wedding day to last as long as possible, don’t you? Party with the best of them and let your unique style truly shine through the decorations, the music you’ve chosen, the dances, and the refreshments that you offer your guests. Your photographer will continue to capture the laughter, the fun, and the moments that choke you up. Your day isn’t over yet, so don’t stay too long at the reception. After your guests have sent you off by throwing spruce needles or aspen leaves at you and your spouse, you’ll be whisked away to a private portrait session, where you’ll have the chance to capture your first moments as a married couple. This is the moment you’ve been waiting for. Who’s up for a helicopter ride? Go up with Ralph Kristopher to hunt for the most stunning scenery that you can find. Land and get out to walk around and shoot more photos. Your romantic day is coming to an end, but you’ve saved the best for last. After the helicopter ride, when it’s just the two of you, you’ll have probably worked up an appetite. Why not have a romantic dinner at the Seven Glaciers restaurant, a AAA Four Diamond award-winning mountain-top restaurant? At the end of the day, you’ll know that you’ve packed in a full, memorable day, but it will only be the beginning of a lifetime together with your spouse. Sound like the day of your dreams? We want it to exceed your wildest dreams. Book the renowned Alaskan wedding photographer, Ralph Kristopher, for your helicopter wedding today. Find out more about our helicopter wedding and helicopter elopement packages, and simply fill out our online contact form to request your dates. However, there are some packing tips that you can implement to make your wedding a success, especially if you’re a cold-natured person who is freezing cold any time the temperature drops below 70 degrees. 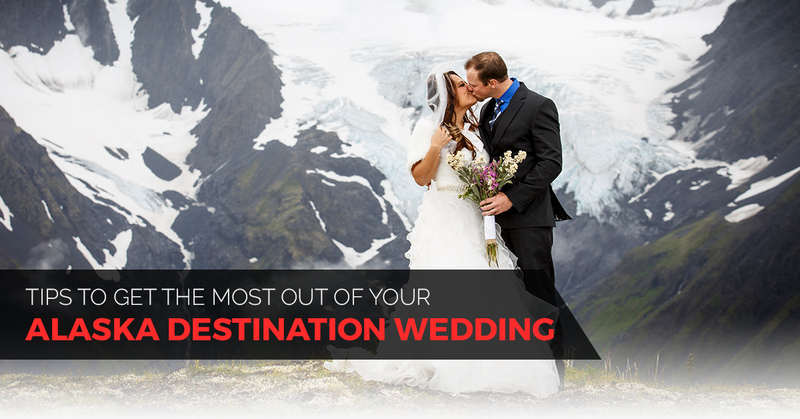 Even if this is you, you can still enjoy your destination wedding in Alaska! You don’t have to spend every minute with your teeth chattering. That being said, we’ve mentioned things like glaciers, snow, and ice on this page, and yes, it’s true that these gorgeous features actually haven’t yet melted, even in summer. Any time we’re talking about walking out into the middle of a big patch of snow and ice, that ice is going to be freezing cold. Now, on a warm day, you won’t feel too bad. But thinking and planning the right things to pack can save you from looking like you’re covered with goosebumps and grimacing rather than smiling in your photos. You want to look relaxed and happy, not like you’re shivering and dying to just get back in the helicopter. If you’re planning your destination wedding right here at Alyeska resort, our climate is very moderate. Highs in the summer are in the 60s, and lows are in the 40s. If you’re cold-natured, you’ll thank yourself if you have a nice, warm, cozy layer that you can put on if you get too cold. A light, quilted down coat is a great option, as it will keep you warm but be very packable and easy to carry around. No one has to see the 5-minutes you spent huddled in your cozy coat in between shots, and you’ll thank yourself that you had a way to get warmed up. It’s no fun to get seriously cold, so do yourself a favor and grab a layer. You’ll be able to show off your bare arms that much better in all your romantic photos. If you think you are likely to be cold on your Alaskan wedding photo shoot, a great idea is to bring a thermos of hot tea with you. There’s no better way to warm up than by getting warm from the inside out. Just be careful not to spill tea on your white wedding gown. Many people instinctively tense up their whole bodies when they expect to feel cold. Take it from a photographer—you won’t look your best in photos where you’re all tensed up. So just give yourself to the cold and relax. The strange part about this is, you’ll often actually feel warmer once you stop trying to brace yourself so hard against it. If you’re walking around on the snow and ice in stiletto heels that punch through with every step, you’ll have a hard time enjoying yourself completely. Or if you have soles that are super slick, you will be having a hard time keeping yourself from falling when you walk on certain surfaces. However, this doesn’t mean that you should resort to wearing hiking boots for your helicopter photo shoot event. Try making sure that your heels have a bigger diameter and your shoes have a non-skid sole. You’ll be fine. When you need a photographer who knows how to make your wedding photographs stand out, choose Ralph Kristopher and the destination wedding photography packages that will make your wedding truly adventurous and unforgettable. Whether it’s the wonder of your helicopter ride or the allure of a glacier wedding, you won’t ever get tired of revisiting your wedding photos, and every time, they’ll bring back all the memories of the fun you had. To request your dates, simply fill out our online contact form and we will be happy to help you with booking the trip of your dreams. Our summer dates fill up fast, as Ralph’s renowned photograph skills are in demand, so book your trip now. Your wedding only happens once. You and your spouse are worth it. Your experience of a lifetime awaits!